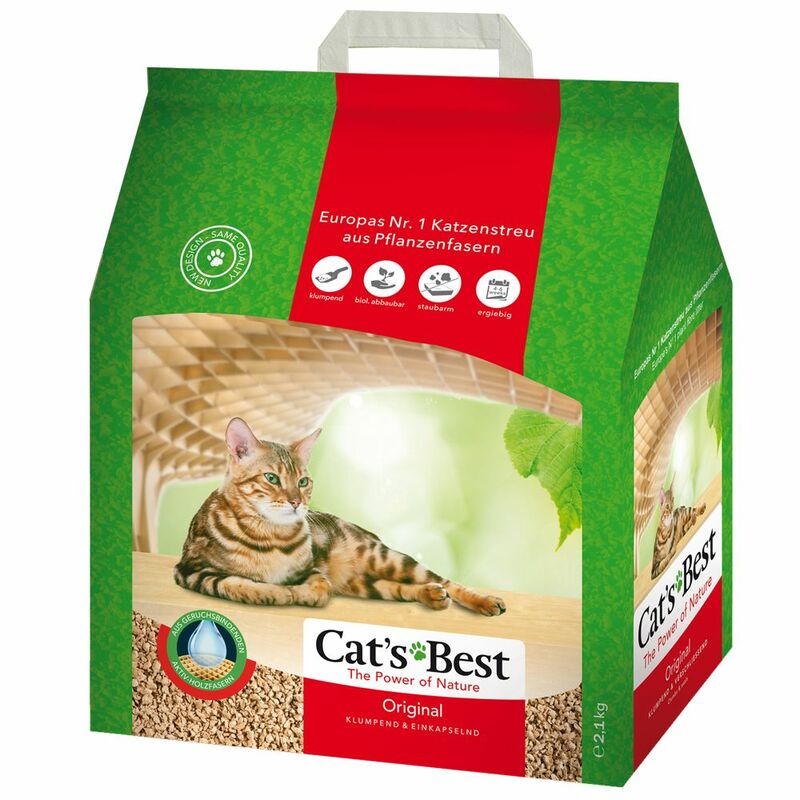 Cat's Best Original, previously know as Cat's Best Öko Plus Cat Litter, is more efficient than conventional clumping cat litter, because the natural plant fibre capillary system is very effective in retaining fluids. Cat's Best Original can be used more sparingly and is therefore more economical than many other types of cat litter. More than 3000 positive reviews can't be wrong! Cleaning and refilling the litter box is reduced to a minimum, as Cat's Best Original can be used for longer thanks to its ability to remain fresh-smelling. This is due to technologically refined active wood fibres, which absorbs moisture and odours. It can be used for up to 7 weeks, meaning leΒ work and lower costs for you. Cat's Best Original is Europe's No.1 cat litter, offering a system of well-being that is perfect for sensitive noses. Cat's Best Original Cat Litter at a glance: Cat litter made from plant fibres Extreme odour absorbent effect: naturally fragrant and without artificial additives Compostable and 100% biodegradable: waste from your cat litter tray can simply be placed in the compost, whilst clumps can be removed from the tray and flushed down the toilet 100% odour absorbent active wood fibres: the finest plant fibres are used, from untreated local fur and spruce trees. These forests are continuously felled and replenished, helping to contribute to the maintenance of natural, healthy woods Very economical: can be used for up to 7 weeks, considerably more than standard cat litter Super absorbent - up to 700% absorbency compared to its own volume Clumping and low in dust Easier to transport Can be flushed down the toilet: Cat's Best Original is made from natural plant fibres, which diΒolve in water, just as toilet paper does. It will not cause pipe blockages or impact negatively on sewage treatment. Please flush using plenty of water! Gentle on your cat's paws User instructions: Clumps should be deposited in the toilet one by one and given plenty of time to individually diΒolve before flushing. Disposal can be made even easier by lightly crushing clumps with a litter scoop to make them smaller. Only one clump should be deposited in the toilet at a time. Allowing the water to fully diΒolve the clumps will ensure that the proceΒ is simple, clean and hygienic. Using the household toilet is not recommended for the disposal of an entire tray of cat litter. In this case, please refer to your local waste disposal regulations - organic waste, compost or normal household waste! Return to Cat's Best cat litter overview. Cat's Best Original is available in the following sizes: 10l, 20l, 30l (10lplus20l) and 40l exclusive to zooplus!. Price just £3.49! Click here to buy now!